He started out November 15, 1923 on a farm in Moravia, Iowa, the youngest of three children. Today, Del Donahoo is known by most everyone and loved by all who know him. He never dreamed he could be happy living and working in a big city like Cleveland, but he has flourished here. He liked the farm life, but learned early on that it was a hard way to make a living. Especially since his family didn't actually own the farm, they worked off the rent, what we might today call a sharecropper. He remembers being eight years old and sitting in the one room County schoolhouse by light of the kerosene lantern. There was no electricity in Southern Iowa in those days. The stove burned wood and power was provided by horses. He would go into town with his family in a horse drawn wagon until one day his father got a Model "T" Ford! He enjoyed the County school and actually taught a year there himself. He had a class of 18 students, all of them eighth graders. He remembers the pot bellied stove in the middle of the room and the excitement that came with learning something new. One of the things he considers to be a major accomplishment in his life happened in that school. He taught a child to read and knows by doing so he opened unlimited doors for him. 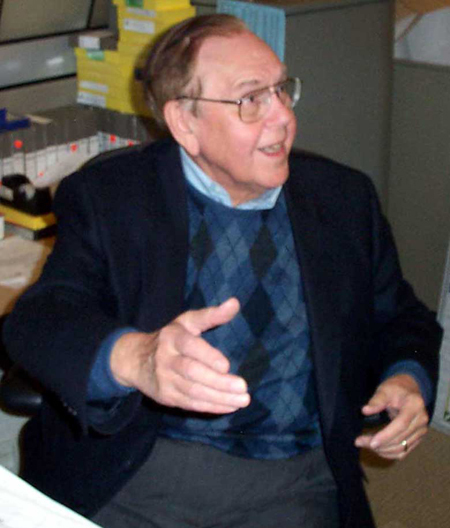 "Teachers had a tremendous impact and influence on students at that time, since there was no television in the homes"
Del enrolled at the University of Iowa in 1943 where he cleaned furnaces for his room and did maintenance work for his board. He got a job as chief announcer at WSUI, the school's 5000 watt radio station. His was one of the few paying jobs at the station. 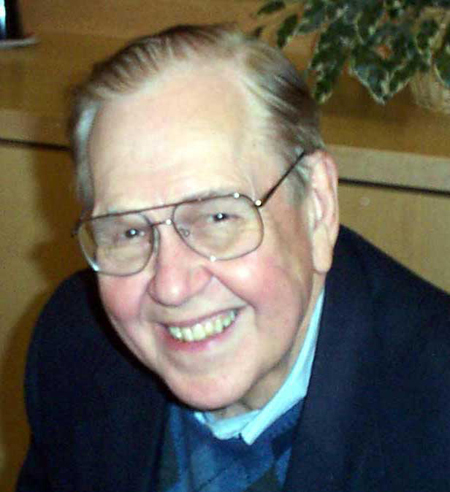 He did scheduling, remotes, newscasts and on-air work. As a young boy he had dreamed of being in radio and it was not coming true for him. He received his liberal arts degree from the University of Iowa and began cultivating his on-air career. Maybe MASH's Radar O'Reilly caught him in KBIZ, since he worked at this Ottumwa, Iowa station for five years. He really enjoyed this time. He was doing a "Man On The Street" show with an audience of 30,000 people - and he was doing it live. "My goodness, you couldn't do that today!" He learned early on that he did not want to be part of the administrative side of the business. That part included hiring and firing and his heart was too big for the firing part. When he had to fire a young man one day the man responded, "How am I going to tell my mother". Del knew for sure right then and there he did not want to be part of that decision making process, and never forgot the young man's expression. While at U of I Del met his future bride, Martha who was a student at Drake College. They were married in 1948 - nearly 55 years ago. "Our love grows deeper as the years go by. She is the perfect mate for me, I need guidance and she provides it. She is the perfect wife and the perfect mother of our two children." The children are son Dennis and daughter Marceliane and both of his children have two children of their own. Del moved into television in Des Moines in 1952 when the FCC freeze on licenses was lifted. But the most significant career move Del Donahoo made was July 1, 1968 when he came to WKYC in Cleveland, Ohio as a minor anchor. 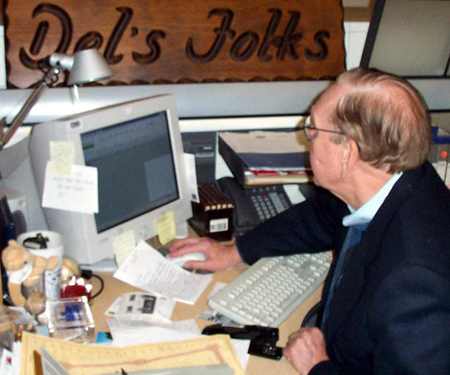 It was this job that eventually evolved into "Del's Folks". 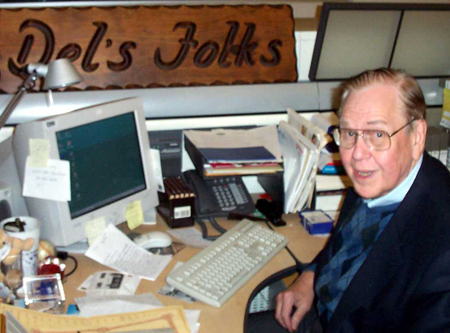 He sees Del's Folks as a huge umbrella for any type of story that would fit, but as his news director told him "If there's news in Del's Folks, it shouldn't be in there"
Del was always a positive man and this gave him the opportunity to spotlight positive aspects of other people and their life. He greatly appreciates story ideas from his viewers; it is the only way he can identify the many wonderful things happening in the world around him. From 1981 to 1998 Del did the "Today in Cleveland Show" with Tom Haley. His wife, Martha, even became part of the show with her now famous coffee and Tom's incessant criticism of it. It was a homey show, not heavy news, not earth shattering scoops, but rather a type of family flavor and friendly approach. "It had that old fashioned touch that I just loved". The two would wear a different hat every morning - literally. It may be promoting an event or just a fashion statement for the day. "The most popular member of the crew was Henry the Rooster" who got them started each day, and of course everybody remembers Tom's little dance, The Haley Shuffle. Del has tremendous respect for the crews and workers at the television shows today. He is amazed at the amount of hard work, effort and energy the Morning Show people put into their production and "it shows in the fine on-air work they do". Del still has his typewriter and loves to write on it. Of course he is kidded relentlessly by the staff, but he finds clues that they use it too. He finally had to get an electric typewriter, but fought long and hard to keep either an Underwood or a Royal. He grew up in a lifestyle similar to the Amish way of life today. This taught him a lot about responsibility and the importance of keeping commitments. He would get up at 5:00 and fill the reservoir, help with the milking and fill the wood box. Dinner would be at 9:00 p.m. and he'd be in bed shortly after. It was a hard life but a very satisfying one and one that he would not change. He views the computer as a wonderful tool but wonders if we really need to be connected to so many people at all times (internet, cell phones, faxes, etc.) and know every little detail of everybody's business. But even with that question in mind, he would not eliminate any of it "There is a lot of valuable and wonderful information out there for us to learn about. Our children literally have the world at their fingertips". Del and his wife share their Bay Village home with their cat, Cookie. "Or maybe I should say Cookie shares the house with us"
It is hard to listen to Del Donahoo and not get a sense of his morality and ethics. 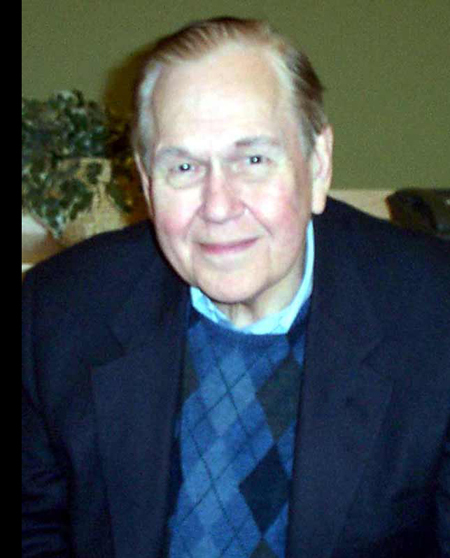 He was brought up as a churchgoer and is a member of The Bay Presbyterian Church. The church plays an important role in his life. He is an usher and one of the "greeters" and Martha is a member of the choir. "It is a very active church with a great minister, a strong missionary presence and great youth"
He is hopeful that today's youth remember their family name and live in a way never to embarrass it. This means staying honest and working hard to preserve the values of his parents and ancestors. Sometimes he sees a story about a young person and can't help but think, "What is this world coming to". But for every story like that there are "a hundred stories that tell me things will be just fine". His parents were very influential in his life and his strong values. They stressed the importance of education and it became just as important to Del. There are few things he would change in his past. "Most of what I thought I wanted in life, I've had or do have and I am so thankful for it"
He's learned many lessons in his life and, by example, has taught just as many. He is a positive influence on many people's lives and a shining illustration that good guys don't always finish last. Copyright � 2003-2011 ClevelandSeniors.Com. All Rights Reserved.